Through the last months of 2017 and into the Spring of 2018, a series of posts were published on danish design review about Danish chairs ... each post was about a specific chair but were posted in a relatively random sequence so sometimes following a type or a designer but not in date order. Here those posts are set out in chronological order and as further posts are added about other chairs from the 20th century they will be included here. There is an INDEX to fast-scroll through the list of chairs included. In many ways, for us now, this chair appears to be old fashioned - looking backward to earlier styles of furniture as a reinterpretation of an historic type of chair - but it can also be seen to mark or define the start of a distinctly modern approach to furniture design. Faaborg is on the south coast of the island of Funen - just over 40 kilometres from Odense. A new museum there was founded in June 1910 to display the work of a group of artists known as the Funen painters and in 1912 it was the artists themselves who proposed Carl Petersen to design a new gallery that was to be built along one side of the summer home and garden of Mads Rasmussen … a wealthy businessman who had made his fortune through canned food. Petersen was a leading figure in the architectural movement known as New Classicism. That might sound like yet another or simply the next revival of a historic style but in fact it was the architects of this group who instigated major changes as Danish architecture moved towards both Modernism and Functionalism. They included in their designs some of the features of classical architecture - so columns and cornices and mouldings inspired by classical buildings in Greece and Italy - but generally, and more important, they used an arrangement of identical rectangular windows across simple, regular and well proportioned facades that provided an appropriate sense of order to new buildings of greater and greater length that were designed to exploit new structural forms possible when using concrete and a beam and post construction that normally dictated equally spaced bays. It was architecture that was above all rational and essentially mathematical … essentially an intellectual exercise rather than to do with instinct or romanticism. Kaare Klint joined Carl Petersen as an assistant in December 1913, as work on the new gallery started, and his first designs were for furniture for the archives - a room at the end of the sequence of galleries with wide doors onto the garden. Drawings are dated February 1914 with designs for a sofa, bookcases, a bureau and chairs. The first working drawings for this chair for the main gallery are dated June 1914 and then a small model and a full-sized prototype were made. The starting point for the design was a Danish form of chair known as a Klismos that had first appeared in the late 18th century and was derived from chairs that had been depicted on classical vases and sculpture. The distinctive features were legs that had a marked curve between the seat and the floor - almost as if the legs are splaying or sliding out at the ground under the weight of the person - and with the back legs continuing up above the seat as posts to support a very sharply curved back rest. Klint designed a chair that was a distinct improvement on earlier designs and was certainly much lighter both in weight and appearance than many versions. In part this was because the chair was actually designed deliberately to be light so that it could be moved around the gallery by any visitor so they could sit down directly in front of a painting to study the work. Klint acknowledged that Petersen had suggested changes to the design of the chair and implied that the most serious discussions were about the way that the top of the back rest should or should not curve outwards. Key dimensions of the chair fit within the system of the classical mathematical proportion known as a Golden Section or, by extension, Golden Rectangles so the overall radius of the arc of the back and the height from the ground to top of the seat rail are the same dimension and are directly related to the overall width of the front of the seat as a Golden proportion. Such a precise mathematical framework must surely have come from teaching by Petersen - by then a leading architect of the New Classical architecture movement in Denmark. A model for the new chair was made but does not survive - lost in a fire - but there is a photograph of the model and it shows an earlier stage in the development of the design. In that model, Klint proposed that the back posts should be continued up above the line of the back rest with a higher parallel but shorter rail with a panel or plaque in the void between the two horizontal rails and that matched a tripartite subdivision of the front rail of the seat that, in an early version, broke forward for the centre third but in the final version was removed and replaced with a simple flat and flush line for the front rail of the chairs that were made for the museum. There was another and more significant change. A full-sized prototype has front legs that curve outwards below the seat … not forward as was found with a Klismos type … but out to the sides and the back legs were vertical. In the final version the front legs are vertical and the back posts are splayed or curved out below the seat but because the posts are set at 45 degrees, on the arc of the back rest, the curve or splays run out at an angle. 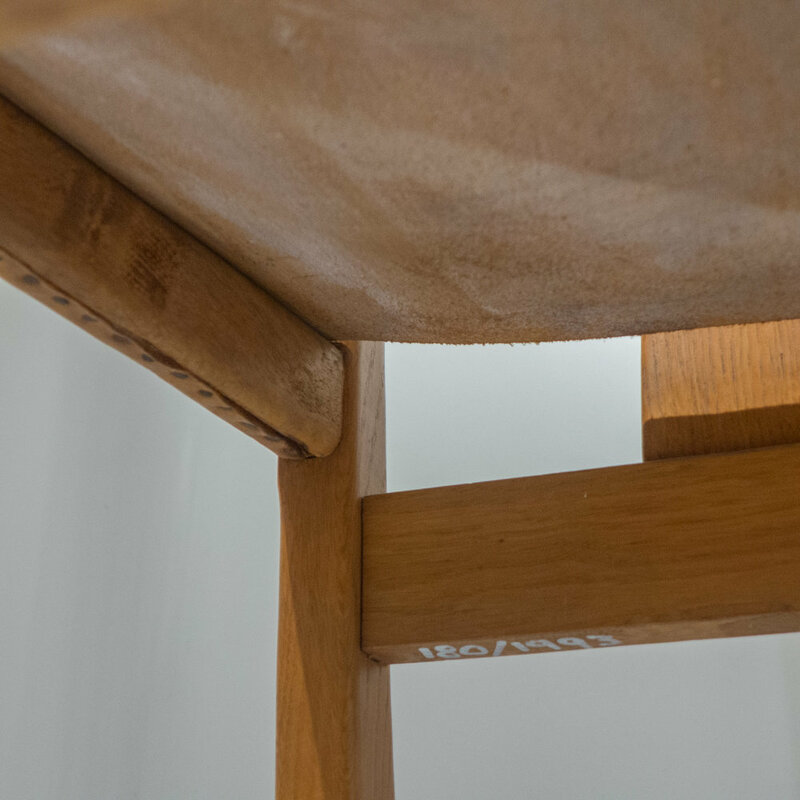 It is this detail of the construction that gives the chair a lighter and more elegant and stylish form where four straight and vertical legs could well have looked severe and actually too narrow and therefore, visually at least, potentially unstable. 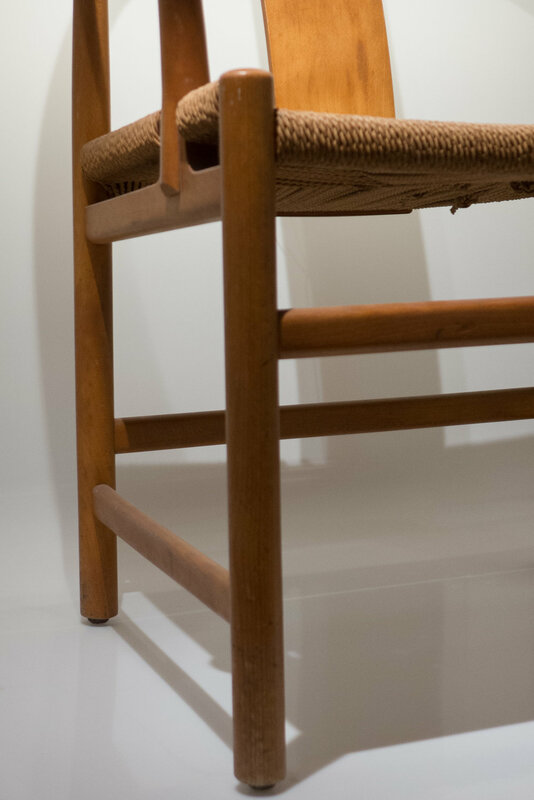 The seat of the chair and the back rest and sides had split cane, in part to keep the chair as light as possible and, in part, to keep the chair visually as light and open as possible so that it did not form a too solid and dominant feature of the gallery. It has also been said that the back rail was kept simple and horizontal, rather than with a slope down the arm rest, so that again it did not draw the eye and distract from the paintings. For the same reason the wood of the frame was given a soft natural finish rather than the heavy varnished or dark polished finish more usual at that period. Kaare Klint and Poul Henningsen were related by marriage and Klint gave Henningsen the important commission to design lighting for the Design Museum but that did not prevent a certain amount of banter from Henningsen. There is a well-known photograph from 1927 in Kritisk Revy, the journal Henningsen published, where he is balancing a chair from Thonet on an outstretched hand. 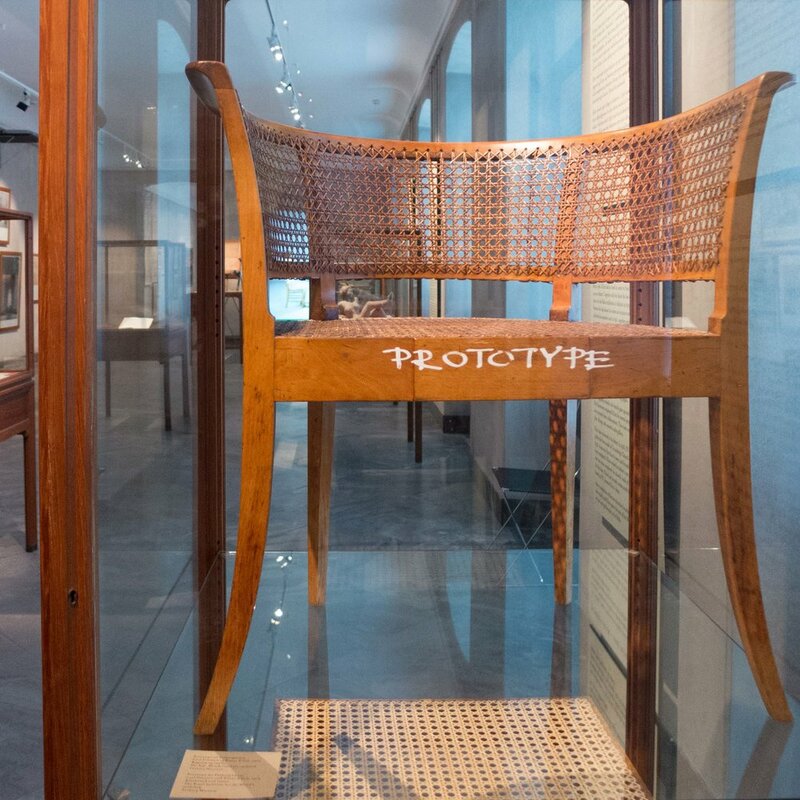 "By making this chair five times as expensive, three times as heavy, half as comfortable, and a quarter as beautiful, an architect can very well win himself a name." He went on to say that he could not sit in the Faaborg chair "without becoming melancholy about the past. What pointed to the future in that chair was probably first and foremost thoroughly conceived and executed craftsmanship." In English that is said to be damning with faint praise but actually the point about thorough conception and execution is a key to not only the subsequent work by Klint himself but is an important way to understand and appreciate the quality of modern Danish furniture both in design and in production. In 1915 the furniture designed by Kaare Klint for the Faaborg Museum on Funen - along with drawings and even a section of tiled floor for the main gallery - were exhibited in Copenhagen in the Danish Museum of Art & Design that was then still in its original building on City Hall Square. Clearly this was good marketing for Klint then went on to design a number of chairs of the Faaborg type for a number of important and influential clients in Copenhagen. The original Faaborg Chair from 1914 has cane in the panels of the back and there was a rather heavier looking version of that chair, with solid panels in the back rest with a top rail that flares out in a more marked way, that was made by the cabinetmaker N M Rasmussen in 1916 for Aage Lunn and then in 1917 a version of the chair in Cuban mahogany was made for Dansk Kunsthandel in Copenhagen by N C Jensen Kjær. This chair is much heavier and more robust than the chair for the Faaborg Museum with deeper pieces for the frame of the seat and the back rest has a much more pronounced outward curve to the lip or top rail. As with the Faaborg Chair, the front legs are tapered but vertical and the back legs are set at 45 degrees to the curve of the seat and back and are not just tapered but are also curved or flared outwards following the form of a Klismos chair. All round, this is a much more robust chair. There is a third rail around the back above the cane seat but below the top of the cushion and the upper part of the leg does not cut in or reduce until it is above this point … in part meaning that the tenons of the rail are housed into mortices in the thickest part of the leg but also to link visually the cushion and the seat rail and create a series of closely related curved lines from the top rail down. 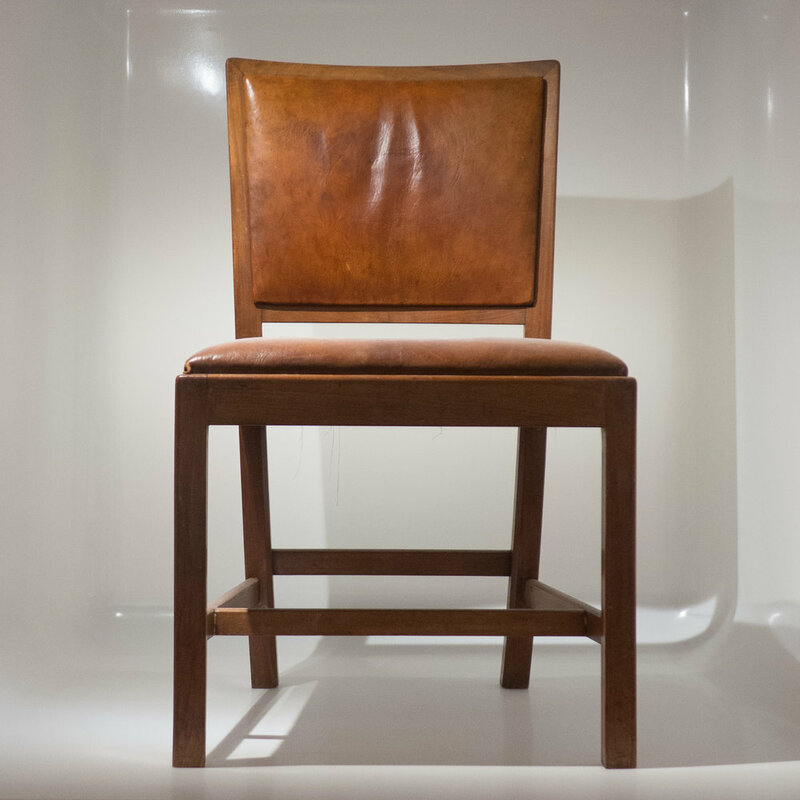 Another variation of the Faaborg Chair, with a fixed leather seat, was produced in the 1930s. Clearly this chair is not a modern chair - not by any stretch of the imagination - but it is important because it shows how styles and forms of furniture from the 19th century continued on well into the 20th century. The chair was designed in 1921 for the Court House in Fredericksberg … the municipality immediately to the west of Copenhagen … so the commission was for furniture for a major civic building that itself dated from the 19th century and therefore, perhaps, more formal and more solid and more traditional furniture was appropriate but it also shows clearly that it is unwise to try and see the history of design in terms of a rapid and inevitable changing of the guard in a clear-cut way or even as something that everyone at the time just accepted as inevitable. The chair appears to be old-fashioned to modern eyes and the design, taking the distinct form of a Klismos stole or classical type of chair, looks back to a style of chair made in Denmark from the late 18th century onwards but it would have been seen as perfectly acceptable to architects and designers of the New Classicism school that was strong if not dominant in Denmark from about 1915 and through to the 1930s. Nor are architects or designers restricted to one style across their work. Born in 1887, Kaj Gottlob was just a year older than Kaare Klint and so, then in his early 30s, he can hardly be written off as an old man out of touch with new trends. He had travelled widely in Greece, Italy, France and North Africa and after teaching at the Technical School from 1915 and then at the Royal Academy Building School he was appointed as a professor at the Royal Academy in 1924. Although his furniture designs were generally in this style, he is acknowledged to be one of the leading architects of the Modernist Movement … by the late 1920s he was seen as a Functionalist - not a term you would use for this chair - and his most famous designs are probably for the two bridges over the harbour in Copenhagen with Knippelsbro that he designed in the 1930s and then Langebro that Gottlob designed after the War and that was completed in 1954. This chair was designed by Kaare Klint in 1923 for the office of the Thorvaldesn Museum in Copenhagen * and made by N C Jensen Kjær. 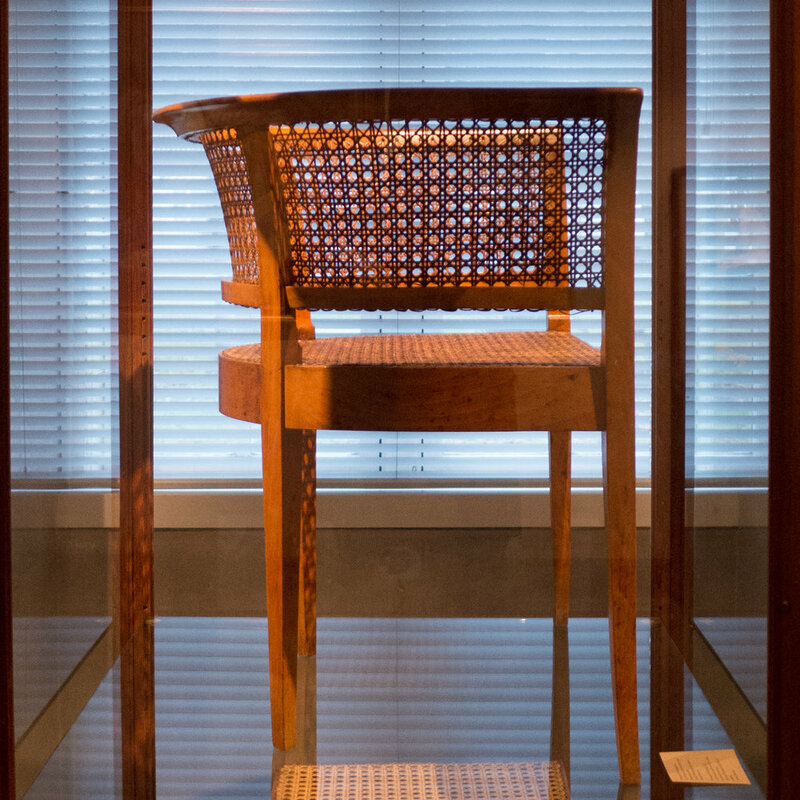 In style, it looks back to the chair that Klint designed for the museum at Faaborg in 1914. Made in burl oak, the frame has a distinct, sharply-curved, and high back support. As with the chairs for the museum in Faaborg, both the front and back legs are continued up to support a curved and horizontal rail for a back rest and there are intermediate rails, half way between the seat and the top rail, but with the upper parts here filled with thin curved panels of wood held in channels in the frame - rather than the cane work of the Faaborg Chair. However, the seat is cane and that supports a separate leather cushion - rather than giving the chair full upholstery - so, as a consequence, the chair is lighter and the frame of the seat can be thinner. As with a traditional chair of the Klismos type, both the front and the back legs curve or flare slightly outwards to the floor to provide more stability but they also make the chair rather more elegant than if they were straight. The precision of the cabinetwork means that there is enough strength in the frame for cross stretchers between the legs to be unnecessary. 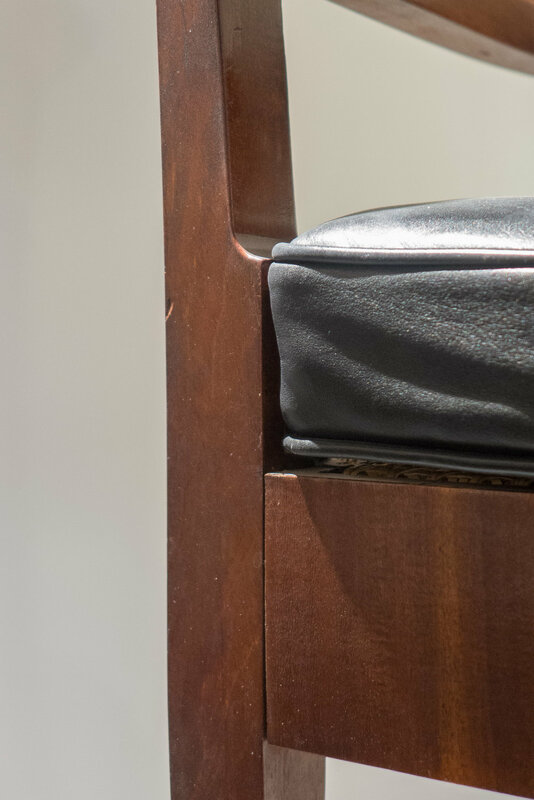 When seen from underneath, it is obvious that the carpentry, where the rails of the seat are joined into the leg of the Thorvaldsen chair, is more precise and stronger so the slightly crude blocks across the leg and frame on the underside of the seat to strengthen the join on the Faaborg chair can be omitted here. Above the seat, the legs are made thinner with chamfers that reduce the cross section from square to octagonal and the rails are also chamfered on the outer side. Again, this seems to be a development or refinement of the Faaborg chair where the legs above the seat are just reduced in thickness on the inner face. 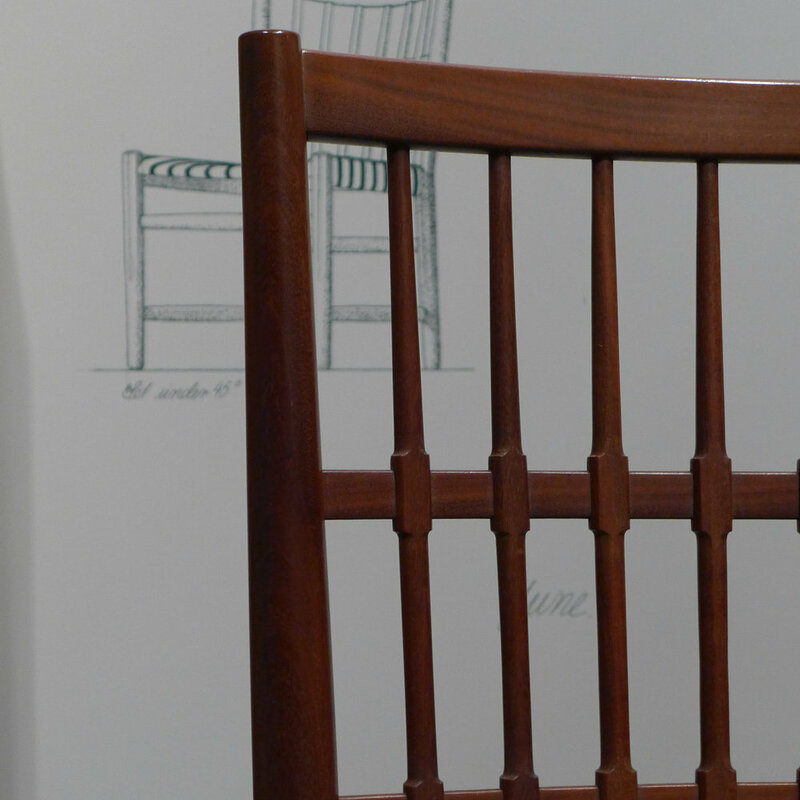 This cutting back from a square cross-secyion of the frame makes the chair look less heavy but these thin chamfers also have a marked visual effect, with the different surfaces catching light in different ways so it is like a stronger line on a pencil drawing that reinforces an outline. Kaare Klint is rationalising and refining his design although there is one change from the Faaborg chair that appears to be retrogressive … on the Faaborg Chair the back rail of the seat is curved, to follow the semi circle of the back rest, whereas here, on the chair for the Thorvaldsen Museum, the back rail of the seat is flat so this chair follows more closely the form of the historic Klismos type where the back support over sails the seat in a distinctive way when the chair is viewed from the side. 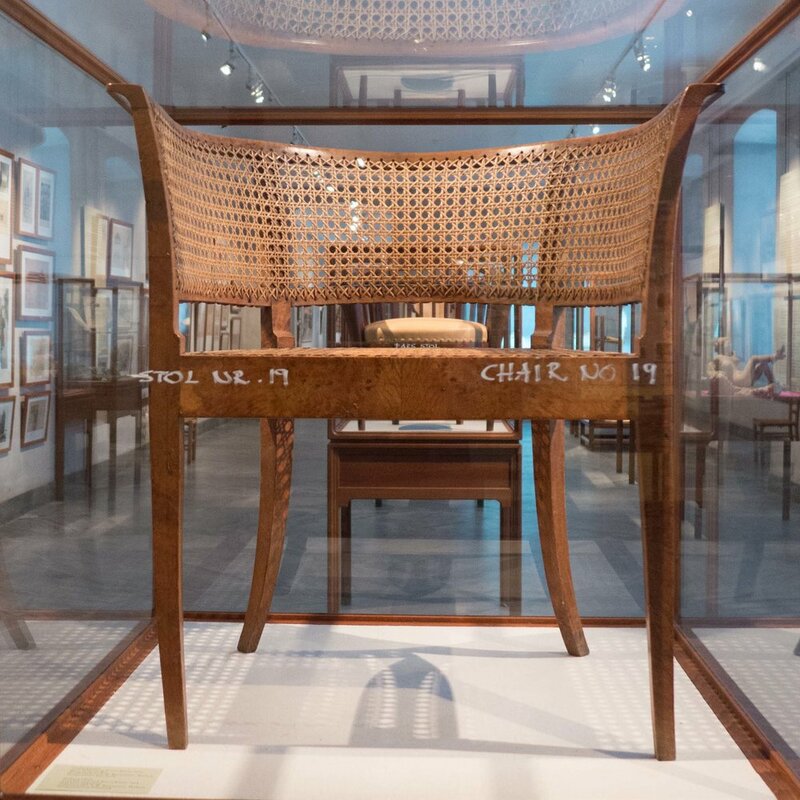 But then, of course, the chair was for a major public building that dates from the 1840s so Klint may well have considered the slightly old-fashioned form more appropriate. * In May 1914, after working with Carl Petersen in Faaborg, Klint married and travelled with his wife to Java for an extended trip and did not return to Copenhagen until the Spring of 1916. He worked first with the architect Povl Baumann and then with Carl Petersen again - on alterations to the Thorvaldsen Museum and work for the David Collection in Copenhagen - and when Petersen died in 1923, Klint continued with both projects. A large version of the chair was used in the lecture theatre in the museum but there are two different and smaller versions to fit at a table or desk and also versions were made with arms - one with plain wood arms and another with padded or upholstered arm rests. 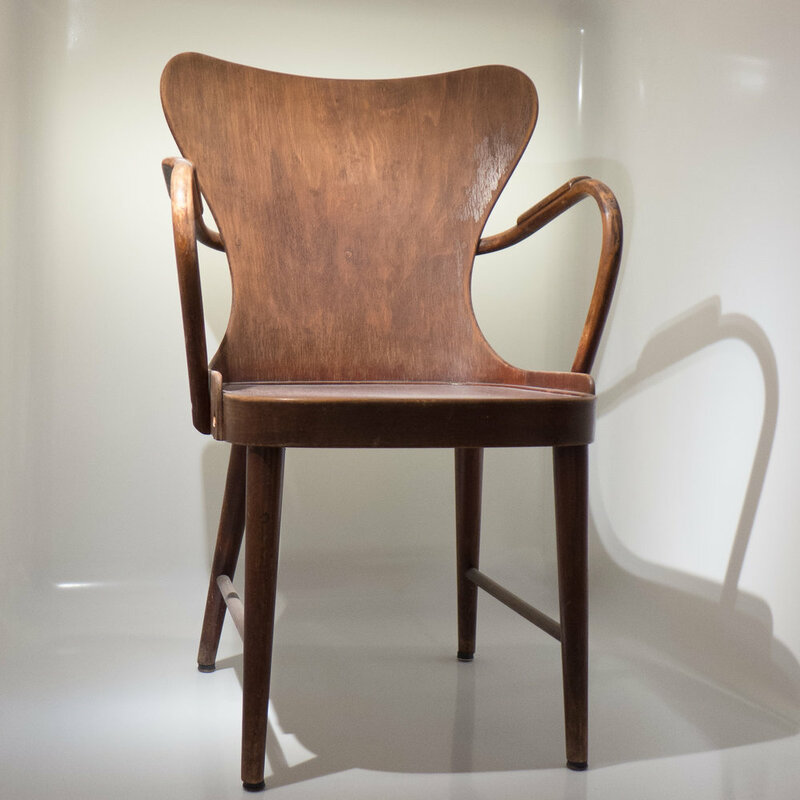 Klint himself acknowledged how much the chair was inspired by a so-called Chippendale chair - an English chair that dates from the middle of the 18th-century and was in the collection of the museum when Klint taught there. That is, the Red Chair is inspired by the style of the earlier chair, that was well made, solid and sitting confidently and square to the floor, with a hard wood frame and upholstered seat but what is crucial is that in his reworking of the design Klint analysed and re-assessed the details of the construction so, for instance in the use of plain but carefully positioned stretchers between the legs of the chair that not only makes it stronger but gives it a balance as well as contributing to that sense that it is a well-set chair. What you see here is how Klint brought to his furniture design an almost clinical analysis of form and construction and that was new. Edvard Thomsen (1884-1980) - whose work as an architect is generally classified, in terms of style, as New Classicism - was an important figure through the 1920s and 1930s in that period when what we would now recognise as modern architecture emerged. One prominent example of his work is Øregård Gymnasium - a large school that he designed in the 1920s in a rapidly-expanding suburb along the coast immediately north of Copenhagen. Initial designs for the street facade had a giant order of classical columns at the centre * although these were omitted in the final design but the long street front of the building was given a deep classical-style frieze across the top that seems to mark the building as part of the movement in the late 19th and early 20th century where historic styles were used in a fairly loose romantic way. However, the careful use of proportions and a stark spacing of large windows across the façade suggests a much more modern aesthetic. 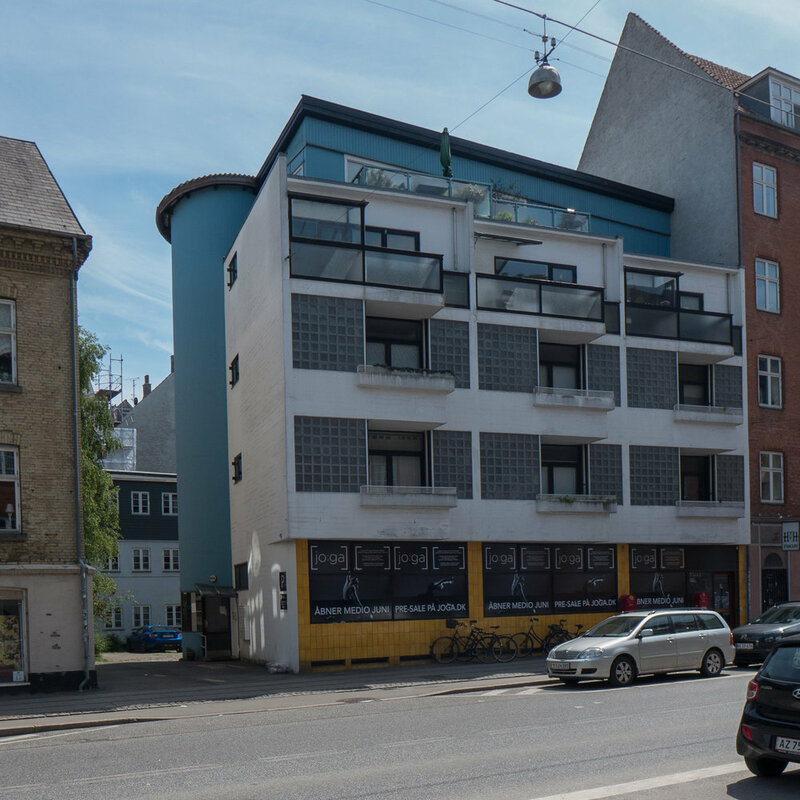 An apartment building in Christianshavn designed by Thomsen - Lagkagehuset on Torvegade where building work began in 1930 - is a strikingly-modern building for that period. A smaller apartment building he designed at H C Ørstedsvej 54 in 1939 is unconventional - avant-garde - and deserves to be better known. It has balconies to the street facing west but with the front edge set at an angle to catch the sun and there is a large circular stair turret towards the courtyard that gave access to open galleries across the back of the building with the front doors of each apartment opening off the galleries. He designed a number of buildings for the zoo in Copenhagen and a very distinct water tower at Jægersborg - another suburb to the north of the city. 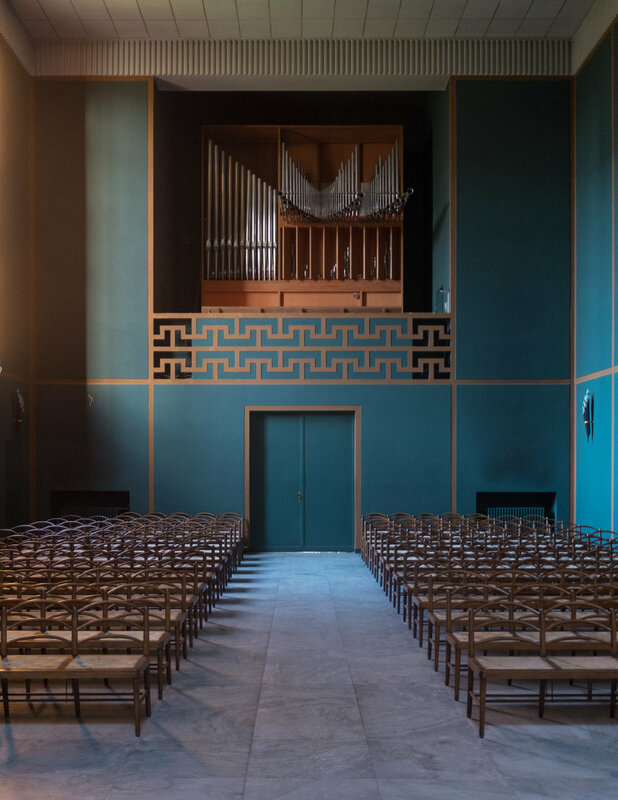 In 1926, in partnership with Frits Schlegel, Thomsen won a competition to design a new chapel and crematorium on Roskildevej in Frederiksberg immediately west of the city in Copenhagen. The buildings themselves were a major modernist design of the period and will be the subject of a separate post in the new year but an interesting set of chairs were designed for the crematorium chapel. For the chancel there were light bentwood chairs with canvas webbing across the seats and a chair for the pastor, again in bent wood, but of a very different form with strongly curved arm rests and leather seat and back rest. In the nave, or main part of the chapel, there are incredible pews designed as linked chairs with arched backs in bentwood that, across a single line, take on the appearance of palm fronds. The pews have rails underneath the seats for hats or bags - like the chairs designed for the Grundtvig Church by Kaare Klint - but it takes a few minutes to realise that although the pews look like chairs lined up together in fact intermediate legs across the front have been omitted so that the construction is more like that of a bench. As with buildings by Thomsen, the initial impression is that the design of this furniture is - to our eyes and taste - 'old fashioned' and if anything looks backwards but this was adventurous and imaginative design for furniture that was, in most respects, functional or at least practical and was commercially produced using far from conventional materials for Danish chairs at this time - so using bentwood and with wide woven canvas tape for the seats so they are remarkably light in weight. This is a key example where Danish architects produced designs for specific and unique furniture as part of the commission for a major public building. Fritz Hansen Eftf produced a number of chairs in bentwood and plywood between 1928 and 1948. Generally, these bentwood chairs in beech are referred to as DAN chairs. This chair from 1930 was designed by Søren Hansen - the grandson of Fritz Hansen who founded the furniture company. It takes as a starting point the famous chairs by Thonet - the Austrian company - that date from the 19th century but simplifies the form. In both chairs, the back posts and the back rest are made from a single piece of steam-bent wood but, in the Danish version, the back rest forms a more generous and perhaps an even-more extravagant loop. The chair by Søren Hansen has a rounded but not circular seat - with a piece of plywood that was dropped into a rebate in the frame - and, like the Austrian chair, it has a closed bentwood hoop below the seat that reinforces the frame and keeps the legs in place so has the function of the stretchers in a traditional wood chair. From below it is possible to see that there is also a robust cross bar to the loop of the back that supports the back edge of the seat and carries much of the weight of the person sitting in the chair. Rather than using traditional mortice-and-tenon joints - normal in the work of a cabinetmaker - the separate parts of this chair are fixed together with screws and bolts so, like the Thonet chair, it seems to mark an intermediate stage between cabinet making and the later industrial production or factory production of furniture that did not require workbench woodworking skills. The back of the chair is lower and broader than the Austrian design so supports the back more and the pronounced backward curve of the back posts of the DAN chair have more than an echo of the the Klismos type and the downward angle of the truncated or incipient elbow rests surely show a form that was picked up by Wegner for his Chinese chairs and the Wishbone Chair twenty years later. This chair, designed in 1930 by Edvard Thomsen (1884-1980) is interesting because it has features that suggest that its design is transitional … in part looking back to the style of older chairs that were an interpretation of classical forms and historic styles but in part the chair incorporates modern ideas and modern joinery. It is not a modern chair, if you apply the simple criteria that no one would assume that it was made recently, but then neither was it an expensive chair made with complicated joinery by a cabinetmaker using expensive timber that would make it more typical of sn earlier period. The shape of the back rest clearly looks to an earlier type - what is called a Klismosstole - particularly the arched and splayed back posts of the chair and the vertical of the back legs that continue up to support a boldly curved back rest - but the front legs are turned and straight so they look much more modern … close to the type of simple turned leg used by Hans Wegner or Børge Mogensen - and the plywood seat is distinctly modern. When seen from below it is also obvious that the chair was designed to be made relatively quickly and easily with parts fixed with screws, rather than with traditional joints, and the frame of the seat is reinforced with triangular plates that are fixed across the corners in a channel cut on the back of the rails of the seat - a form of reinforcement or strengthening still used for the seat frames of chairs. In contrast, the chairs that Thomsen designed for the Royal Academy of Fine Arts at Charlottenborg in 1924 now appear to be much more old fashioned - more certainly a revival or reinterpretation of a classical style that looks backwards rather than looking forward in anticpation to Danish chairs of the 1930s and 1940s or onwards. After studying technical drawing for a year in 1922 Rigmor Andersen entered the Royal Danish Academy of Fine Arts where she was a student under Kaare Klint in the new School of Furniture and then, from 1929 to 1939, worked in Klint's studio. Her designs for the furniture for Kvinderegensen, a residence for women students on Amager Boulevard in Copenhagen was one of her first major projects and included this chair from 1931. It was made by Rud Rasmussen, the cabinetmakers who produced much of the furniture designed by Kaare Klint, and is in mahogany with leather for the seat and back rest so immediately it is clear that this was a chair that was well made in an expensive imported wood and made to last … mahogany and leather are not just robust but age well. The chair is also unfussy and that seems to make sense when you find that it was made for an educational building. The Kvinderegensen for female students was designed by Helge Bojsen-Møller and was completed in 1931 or 1932 in a stripped back, almost stark classical style in brick with good proportions … so rather like the chair, of it's period but anticipating the simple forms and reduction in decoration found in more recent design. With the chair much depends on the quality of the cabinetmakers work with crisp sharp lines to the legs and stretchers with precise joins and with a neat crisp chamfer along the bottom front edge of the frame of the seat and down the inner edge of the legs where the chamfer runs out at the top precisely where it meets the frame. 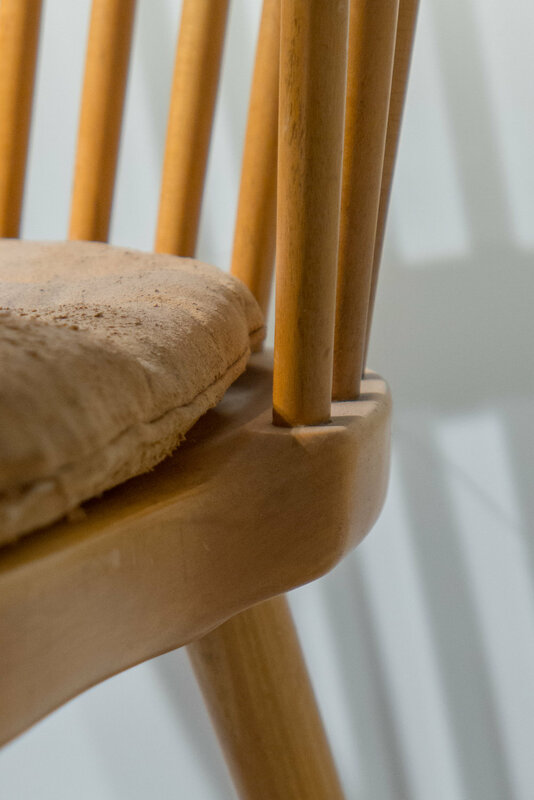 In part, this is a visible demonstration of the time and care spent making the chair but it also has a visual impact giving the wood a crisp line along the edge where the light catches the angle of the chamfer. It works in the same way that a bead or very thin rounded moulding works along the edge of a drawer that insets into the frame of the carcase or a thin quadrant moulding works on the edge of a door or drawer that stands proud of the frame. It is like putting a thin but strong line in darker pencil on a drawing to reinforce the edge of a shape or volume and here gives the chair a sharper or more precise outline. Having looked at and written about a number of Danish chairs that were designed in the 20th century, it seemed important to include this chair - The Snake Chair designed by Poul Henningsen - not because it is remotely representative - it is actually perversely unique - but because it is distinctly modern in the materials it used. With a single coil of tubular steel to support the seat and back, it breaks with almost all conventions, but, curiously, it also appears to be 'of it's period'. So if someone who did not know the chair was asked to guess its date they would, at the very least, see that it is unlikely to be a recent design but nor is it old, in the sense of being traditional or conventional. If then told that it dates from the 1930s many would see that it fits with the general style of that period … with aspects in common with furniture from the Bauhaus in Germany or with Art Deco furniture from France or the Netherlands. It appears to be even more certainly of that period when you see photographs of the chair along with the piano that Poul Henningsen designed so a combination of materials - tubular steel - and a sort of deliberately outrageous look sets a sense of a style of a very specific period. The form of the chair is the product of a highly individual and unconventional designer who was known for his work designing lights that were - and still are produced by the Danish company of Louis Poulsen - but Poul Henningsen was also a journalist - he wrote for Politiken and edited the journal Critical Review - was an advocate of jazz music - wrote enthusiastically of his admiration for Josephine Baker when she performed in Copenhagen - wrote songs himself; was a filmmaker and was - appropriately - architect to the park at Tivoli. Mogens Lassen was just a year older than his brother Fleming and both were at school with Arne Jacobsen. All three became architects and designers and Fleming Lassen worked in partnership with Jacobsen on several major projects in the late 1920s and through the 1930s including working together on the House of the Future … an exhibition entry from 1929 … and the Library at Nyborg and the town hall at Søllerød. Both Mogens and Fleming Lassen travelled widely but it was the buildings by Mogens, particularly the villas he designed, and his furniture that were closer to is generally recognised as the International style of the 1930s. Mogens Lassen studied in France and was offered but turned down a post in the studio of Le Corbusier and returned to Denmark where he established his own design studio in 1935. The cantilevered chair, designed in 1933, takes as a starting point a chair with a tubular metal frame by Ludwig Mies van der Rohe … the MR20 designed in 1927 … but where the German designer has a simple seat and back rest with a continuous panel of cane across the frame, Mogens Lassen produced a striking and unique design with a basket woven around the frame that encloses the person in the chair. As with the work by Poul Kjærholm, some 20 years later, the texture and natural colour of the cane is used as a contrast and as a foil to the metalwork. Through the 20th century many Danish designers used woven cane for the seat and back rests for chairs … for instance the high-back chair, arm chair and sofa from the 1960s by Bernt Petersen … where the frame in wood is the key element of the design and the panels of cane infill … but few created designs that so closely retained the character of a basket where the cane work is the structure. Arne Jacobsen designed the Pariserstolen in 1925 but that looks like a chair for a conservatory or garden terrace. 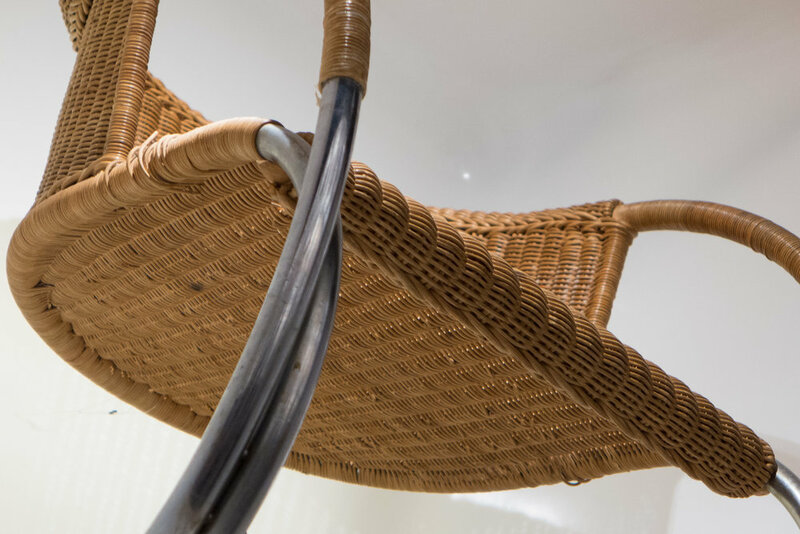 One of the few modern Danish chairs with a comparable focus on cane work as a basket is the Kurvestol by Nanna Ditzel from 1950 that was made by Ludvig Pontoppidan … a chair that has a large hemisphere of basket with a strong flat rim that was supported on a simple frame in teak with four turned and tapered legs with thin straight cross rails. This is not exactly a recliner - you don't lie back in a horizontal or almost-horizontal position - but by having the foot rest raised level with the seat you are 'sitting with your feet up' to use a slightly old-fashioned English phrase that is more than a straight description of how someone is sitting but implies just a bit of pampering or self indulgence. 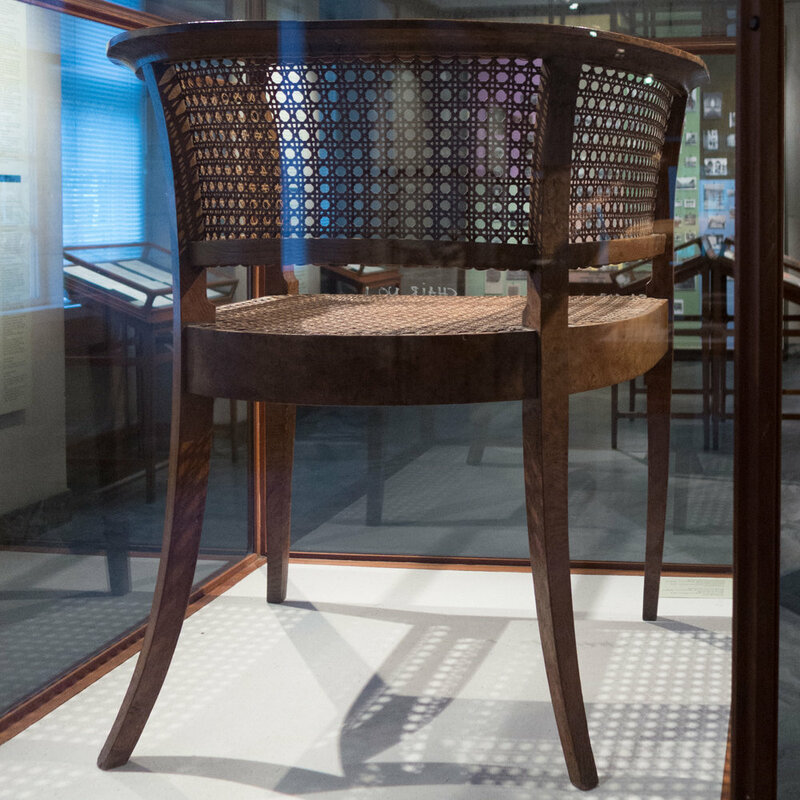 The chair looks as if it would be most appropriate for the deck of an ocean liner but when it was first shown at the Cabinetmakers' Guild Furniture Exhibition in 1933 it was described as suitable for a garden terrace. It is a clear example of Klint's interest in ergonomics - with a careful focus on dimensions and angles so that, for instance, the angle of the back rest, although fixed, was comfortable and the head rest was at the right height for someone of an average size and the arm rest not only has to be in the right relationship to the seat, in terms of height, but the right length so that the hands are naturally close to the ends so, with palms down and fingers over the ends, the weight of the body can be raised slightly and transferred forward to stand up. It seems odd to bother to describe that movement … we change our centre of gravity automatically without analysing what we are doing as we stand up from a chair … but if the designer gets it wrong then we feel uncomfortable or awkward without perhaps understanding exactly why. However, the chair also illustrates well two other aspects found in the design of modern Danish furniture but rarely discussed as much as either the craftsmanship or the aesthetics of a piece. First the chair is ingenious. This is clever and deliberately complicated design. The foot rest is supported on a relatively thin and light prop and when raised it doesn't just support the feet but forms a continuous curved line that runs from the ground at the back to the front edge. So the foot rest has a practical function but also contributes to the clear aesthetics of the design. But when the prop is tucked back, the foot rest hinges down and the chair can be used more conventionally with the feet down flat on the floor. So ... beautiful and practical. The back is slightly concave and almost the same curve is picked up for the strut that forms the front leg and the support of the arm rest. The seat has a frame which also acts as the front and back rails of the chair and the seat extends back beyond the line of the back rest and the bottom cross piece of the back rest is raised so that neither sticks into you. Then the whole chair actually folds up so each of the pieces, if not actually fitting snugly together, has to at least be the right length to work with the hinge points or the chair would only half fold or, worse, might fold in on itself with someone sitting in it. So every line and every angle has to work when the chair is open and when it is folded. That's the ingenuity. To design the chair was, in effect a very complex mechanical puzzle and was about the resolution of engineering problems even if the workmanship is that of a cabinetmaker. And the second aspect that was and still is important in Danish furniture making, though rarely discussed, is what can be described as the engineering of fixings and joins. So here in this chair, the success of the piece depends on the finely-made brass hinges and pivots that hold the chair together. Not only do they have to be strong enough to take a lot of weight - not just dead weight but in some parts weight acting on a lever - but these must have been designed with some form of locking nut … not that the parts are locked in place, as the sections have to open and close, but they have to lock onto themselves so that over time they do not work loose. The simple form of this is to have two nuts on a bolt so that one is held against the piece and a second bolt is added and then the two bolts turned in opposite directions to lock them into place against each other but leave a constant and hopefully unchanging space between the inner nut and the head of the bolt on the other side of the piece being held. But these brass fittings are much much more sophisticated than that. What you see in the deckchair is not the use of ordinary bolts and fixings but pieces that were almost-certainly made specifically for these chair and they are carefully recessed, so they are flush with the surface of the timber, and even the positions of screw heads were determined to hold the fitting in place without splitting the wood. The Devil, as always, is in the detail. Designed by Arne Jacobsen in 1934, this chair was used in the restaurant at Bellevue - part of a large complex of buildings, including a theatre by Jacobsen completed in 1937, set just back from the beach at Klampenborg, 10 or 11 kilometres north of Copenhagen. Jacobsen used the chair again in the town hall at Søllerød - a major building 9 kilometres north-west of Klamenborg that he designed with Flemming Lassen. Work there started in 1939 and was completed in 1942. Made by Fritz Hansen, the chair is interesting because it is one of the first commercial furniture designs by Jacobsen that was put into production and is important because it appears, in terms of its style, transitional - reminiscent in some ways of standard chairs for dining rooms from the early 20th century but at the same time novel and modern in that it looks relatively simple, with no carved or inlaid decoration, but uses innovative and experimental forms of construction. Using new materials or established materials but in a new way marks chair design in Denmark in the second half of the 20th century. The Bellevue Chair has a frame in wood but rather than having either a simple plain seat in wood or an upholstered seat of some kind - as in traditional dining chairs of the period - the seat is formed by a single piece of thick leather that is stretched across and over wood bars or rails on each side that are set between the front and the back legs. The leather is fixed with closely spaced nails along the bottom edge of the side rails but is not fixed across the front or the back. Leather was used for covering the padded seats of more expensive chairs, particularly for library chairs or formal dining chairs, and in some contemporary examples the upholsterer set the nails in a continuous line along the bottom of the front face of the frame of the seat as a decorative feature - but this chair by Jacobsen, with the seat suspended, has more in common with camping chairs or folding safari chairs from this period although those were normally covered with canvas rather than leather. By not having a padded or covered seat one stage of work that had to be undertaken by a skilled and specialised craftsman was avoided. Upholstery was a separate and usually the last stage of production, when the chair was either covered over the wooden frame made by the cabinetmaker, as in an upholstered arm chair, or padding and covering for a seat, and possibly for a padded panel for a back rest, were made with separate frames that were then dropped into the open frame of the seat of the chair made by the cabinetmaker. One advantage of upholstery over a separate wooden frame for a seat for dining chairs was that when it was in place it reinforced and strengthened the framework of the chair which meant that the chair itself could have a lighter structure that you could see but there could also be plates or short struts across the corners under or inside the seat cushion that can not be seen but reinforce or strengthen the finished chair. Some features of the Bellevue chair are unusual simply because they had to compensate for that omission of a seat frame. So the pair of cross rails at the front are certainly distinctive. Many chairs, if they have a strong seat frame and relatively strong legs, omit cross rails at the front completely but here, in the Bellevue Chair, the upper rail provides the strength that would have been provided by a seat frame but because the front legs and rails are relatively thin and are round in cross section, that restricted or limited the thickness and therefore the strength of the cross rail, so a second rail was added to stop the front of the chair distorting or twisting to left and right as a person sitting in the chair moves. The upper cross rail had to be set low enough so that for someone sitting on the seat - even if the leather sags down - they do not feel the rail in the back of their leg - somewhere just above the knee - and the lower rail had to be high enough so that if someone tucks their feet back under the seat - particularly when they shift their weight forward to stand up - then again they should not feel that their legs are against that rail. The tops of the front legs are proud of the seat, so that the mortice for the side rail is not at the very top so with a possibility that the wood could split, and the top of the legs are also carefully rounded as some people will rest their hands here and push down as they stand up. The side rails of the seat are relatively robust - the width is limited by the width of the front and back legs into which they are housed but they have to be thick enough to take the line of nails along the underside without splitting. Their height is determined in part for how they look - for aesthetic reasons - so the chair, when seen from the side, has to actually look as if it is supporting the weight of the person. These side rails are relatively strong but the side frame of the chair is given additional strength and rigidity by having cross rails towards the bottom that run back from the front leg to the back leg just above the floor. With heavier chair frames - where the side pieces could be thicker and the mortices and tenons holding them in place more robust - these rails can be omitted but here they are necessary to stop the front and back legs splaying apart when someone sits down and stops the sides of the chair distorting as someone leans back. The strength of a mortice and tenon join comes in part from the sharp cutting of the shoulders of the tenon and these are obviously more difficult to cut precisely when the mortice is set into a rounded timber. The leather of the seat runs across just in front of the seat back and is not fixed along the back edge. The back legs are in a single piece from the floor to the underside of the back rest and these timbers, in profile, are curved, partly to make them appear more elegant when seen from the side but also for simple practical reasons … a straight vertical back is actually slightly unstable because the chair can tip backwards more easily as someone sits down or if they lean back in the chair. The back leg splaying out forms a sort of buttress and does change the tipping point for the chair. The lower parts of these back legs, below the seat, are square in section for additional strength and to take a strong cross bar that is set down, out of sight, below the seat and this piece not only makes the back part of the frame stronger, so a lower rail across the back towards the floor can be left out, but the back rail also has to be strong enough to take the long mortice for the bottom of a simple central splat that forms the back rest of the chair. This splat - a thin plank of wood - is gently curved in profile and runs up to a top rail that is too thin to be described as a head rest. Again it is round in section and is set across the splat like the top cross bar of a letter T. Was Jacobsen suggesting that this top rail could actually be used like a handle for the lifting and moving the chairs across the restaurant? Above the seat the wood of the back pieces are rounded in section and they are housed into the underside of the cross bar just in from each end. Again, as with the front legs, if the side pieces and the cross bar met at a corner, rather than with an overlap, it would have made the joining of the pieces of timber a potential weak point in the chair frame and this was, after all, a commercial chair for use in a restaurant where it would be subject to heavier use than in a home. In fact the whole design can be seen as an interesting exercise in balancing the ergonomics of the design with experimenting with construction details so there is, at each stage, a sort of careful trade off between the appearance and the strength of the chair. A sort of reductionism within practical constraints: thinning down parts of the frame makes it more elegant and stylish but it is not taken so far that it makes the chair weak or unsteady and, particularly in a public restaurant, the last thing a young designer needs is people ending up on the floor where chairs have collapsed. The Theatre and the adjoining restaurant at Bellevue were designed by Arne Jacobsen and were completed in 1937. They are set just back from the beach on the west side of the coast road that runs north out of Copenhagen. Klampenborg is at the edge of an ancient forest that had become an important public park by the 19th century and the park and Bakken, an amusement park in the forest, were served by a suburban railway that terminated here at Klampenborg. With the building of the railway Klampenborg developed into a prosperous suburb. The park and the beach here, with changing rooms that were also designed by Jacobsen, were a popular destination for people from the city and through the 1930s there were also launches or boats that brought people here for a day out to swim or go to the amusement park or go to the theatre. Immediately south of the theatre is Bellavista, apartment buildings also by Jacobsen and also dating from the 1930s, and south of the apartment buildings houses again by Jacobsen. High stools for the bar in the restaurant - with butterfly shaped back rests - and seating in the theatre - with curved wooden backs forming undulating lines across the auditorium - were even less conventional than the dining chairs. 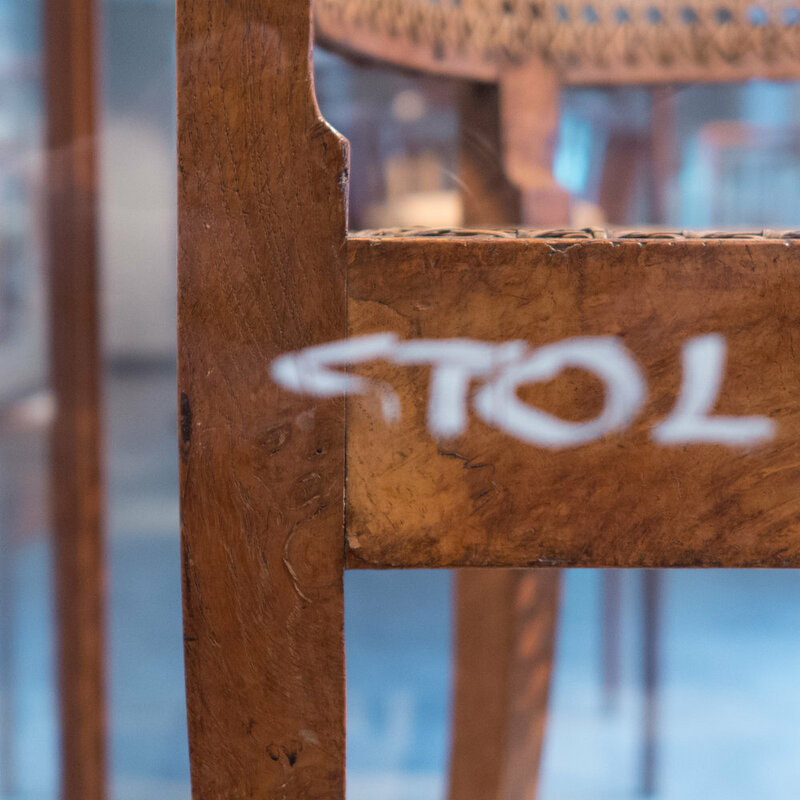 In the typography of chairs in the new display at Designmuseum Danmark, a distinctive group are the chairs influenced by Shaker furniture made in the United States from the late 18th century onwards. This was simple but well-proportioned and well-made furniture with styles and forms taken with them by members of the religious group when they emigrated from England to America to establish independent communities leading a simple and devout life. One type of chair made in the 1820s in the Shaker settlement at New Lebanon had turned legs and spindles and a high back of the type usually called a ladder back although the cross pieces of the back rest tended to be thin but flat, curved and shaped pieces of flat wood rather than spindles or rungs. Decoration was kept to a minimum and was usually restricted to what could be done with turning so with knops or rings on the turned legs. Most cross rails and stretchers between the legs were turned and seats were often woven from ribbon width lengths of natural coloured textile … cotton or linen webbing. There was an example of a Shaker rocking chair in the collection of the design museum and this appears to have been an inspiration for the church chairs designed by Kaare Klint in the 1920s for both the Grundtvigskirchen and for the Bethlehem Church in Copenhagen. Several versions of the chair were produced. The Church chair above has a book holder across the back … a wide shallow box in thin wood where the person sitting in the row of chairs behind could place bibles and prayer books … and there are extra spindles across the space under the seat to hold a hat during the service. A version with arms was made by Bernstorffsminde Møbelfabrik from 1939 onwards. In the church, the chairs can be linked together with a long pole slotted through leather loops behind the front legs. 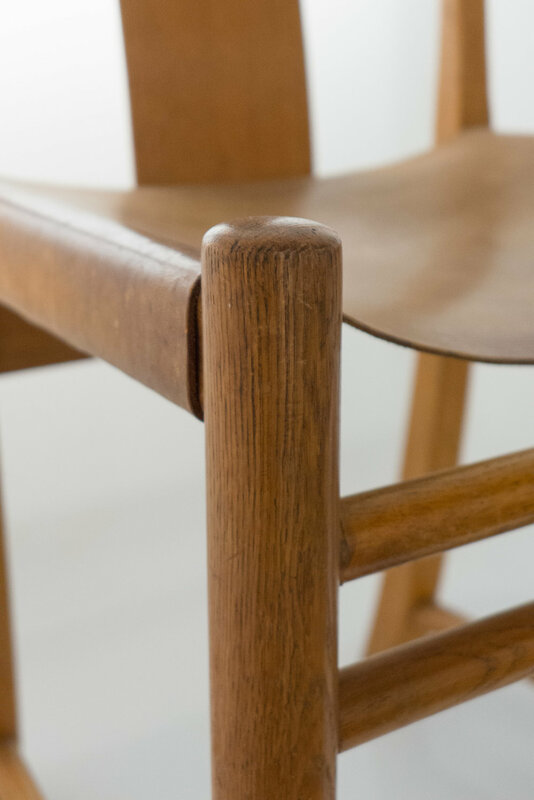 This is an early chair by Hans Wegner and is one design where he sticks closely to the form of construction and the details of a traditional chair … here an English style of chair known as a Windsor chair. When he was a student he had to measure and draw an old Windsor chair as part of his training. For a Windsor chair with a high back there were two types … one with a length of steamed and bent wood forming a high loop with the space filled with vertical spindles or, as here, with one piece of curved wood set horizontally at the level of the arm rest and a shorter timber at a higher level, normally as a head rest, with spindles from that down to the top of the arm / back rest. As here, the standard `Windsor chair had a solid wood seat - rather than a frame with cane or upholstery - and the seat was usually shaped rising to a slight ridge on the top at the centre to the front. There are stretchers running back from the front to the back legs on both sides but not across the front or the back although there is a central stretcher across between the side stretchers forming an H shape below the seat to reinforce the frame of the legs. Both side stretchers are turned with a distinct swelling or bulge at the centre with simple holes drilled to take the ends of the cross stretcher. In England this type of chair was made all over the country and mostly for farmhouses and cottages but was generally known as a Windsor as some of the best were made in the area of Berkshire around Windsor. The spindles were usually in beech and were turned in the forest or beech woods up on the chalk hills by men working with rudimentary lathes driven by a sapling or long flexible pole bent over the lathe to act as a return spring with a rope running down, looped around the work being turned and then on down to a plank that acted as a pedal. The pedal was pushed down whipping the spindle round then released quickly to raise the pedal back but with the piece of wood continuing to spin in the same direction. More complex turned pieces for legs could also be turned in the forest and then these parts were carried down into a nearby town where the chairs were put together. The seat could be made elsewhere and was often a different wood … sometimes oak or even yew. The library in Nyborg (on the east coast of the island of Funen) was designed by Erik Møller and Flemming Lassen, following a competition in 1935, and the building was completed in 1939 with furniture designed by Hans Wegner. 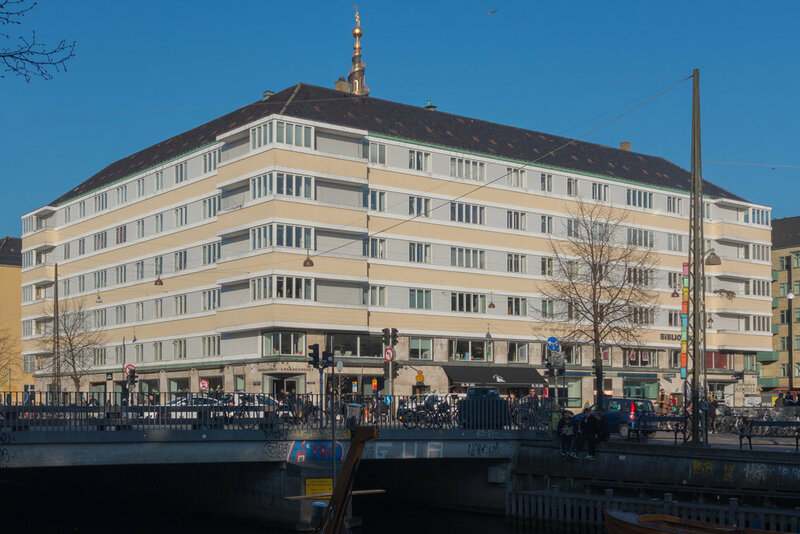 Erik Møller worked together with Arne Jacobsen on the town hall in Aarhus and again it was Hans Wegner who worked on drawings for the furniture and the fittings. Finn Juhl (1912-1989) had trained as an architect, at the Royal Danish Academy of Art, and not as a furniture maker, so his design for the Pelican Chair was realised with the cabinet maker Niels Vodder and two of the chairs were shown at the exhibition of the Cabinet Makers’ Guild in 1940. With their strong sculptural form and simple but hefty wooden legs set at an angle, the chairs must have caused a fair bit of discussion and controversy at the exhibition and subsequently commercial production was limited. 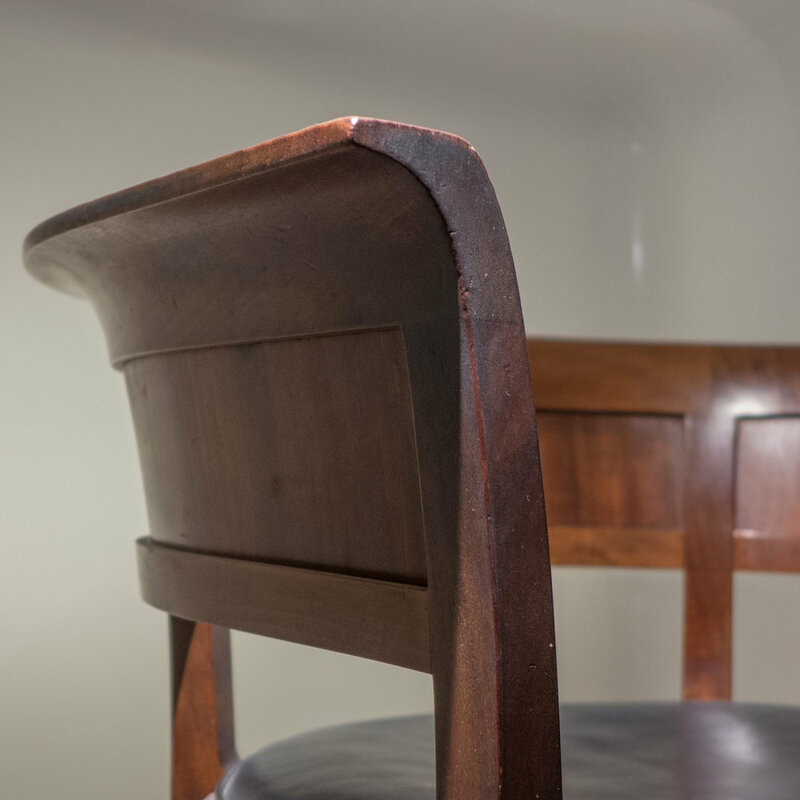 A version of the chair - with thinner and upturned wings set lower to the back - was shown at the Cabinetmakers' Exhibition in 1939 with a sofa, desk, chairs and shelves that were all made by Niels Vodder. In a review, Hans Hansen wrote in Arkitekten that the "general opinion will probably be that the whole arrangement is most peculiar, but it offers a valuable chance to challenge established norms, and arouse discussion ...." and when this, the final version of the arm chair, was shown in 1940, Eiler Abel, again in Arkitekten, thought the chairs "resemble more than anything tired walruses." OneCollection reintroduced the design at the Cologne furniture fair in January 2001 and now, to mark its 75th anniversary, have produced a special edition of the chair covered in a fabric based on a drawing from 1942 entitled Macbeth by the Danish artist Asger Jorn - a contemporary of Juhl’s who studied in Paris under Fernand Léger in the late 30s and also collaborated with Le Corbusier. Although the new Pelican is true to the scale and shape of the original chairs from the 1940s, those first chairs had a pine frame with several layers of upholstery but for the current version this has been replaced with a hard foam shell with a steel core. Through the 1930s and well into the 1940s furniture designers produced chairs that took as a starting point the square set frame of legs and stretchers and upholstered seat and back of the Chippendale type or 'Red Chair' type by Kaare Klint. 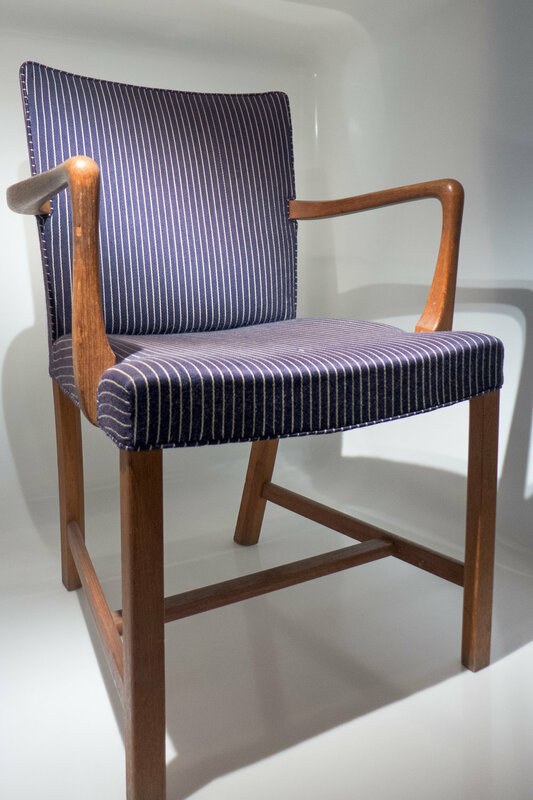 This example by Børge Mogensen and Lis Ahlmann dates from 1941 shows that, although more organic and rounded forms of chair by Finn Juhl or Hans Wegner dominate our view of post-war Danish chair design, this more traditional chair type has a distinct place in the evolution of modern Danish chair design. Note the L-shaped wood arm rest fixed to the outer face of the side rail of the seat, half way along, and to the outer edge of the fully-upholstered back rest, about half way up. The upholstery is over a traditional cross basket weave of textile webbing with, presumably, a layer of horsehair padding. The inner edges of the legs are finished with a pronounced chamfer - to reduce the visual weight of the leg - and the chamfer runs out properly at the top, just below the point where the rails of the seat are housed into the legs. A small arm chair very like this was first shown by Morgensen at the Cabinetmakers' Exhibition in 1939 but what is much more interesting is that these formal and more traditional designs seem to mark the end of his training and a point of change because he started to work for FDB - the Danish Co-operative - in 1942 and his designs for furniture made for them evolved rapidly so he produced simple and well-made chairs of very different forms for a much broader range of customer. This chair is a variation on the form of the Red Chair by Klint but lighter with turned legs - round rather than square in cross section - and a lighter shallower upholstered seat but as a whole, and given the quality of the craftsmanship and the exotic wood used, it must have been aimed at a fairly wealthy middle-class market. 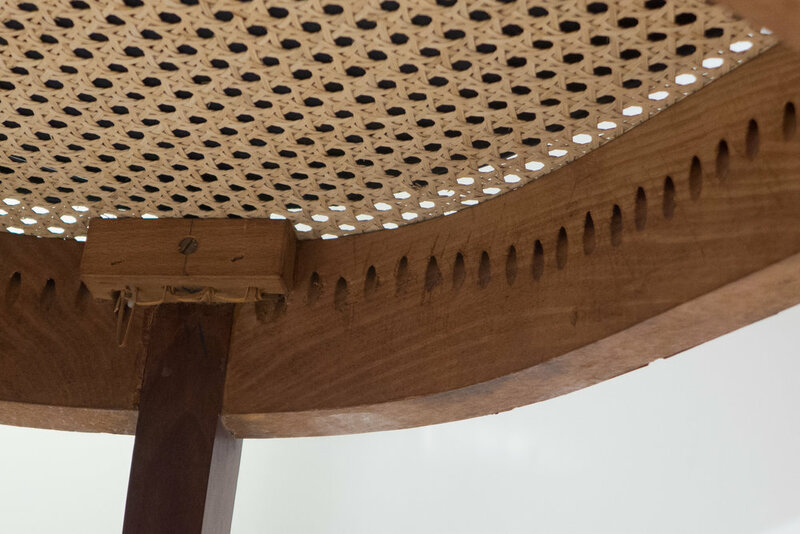 With a narrow curved top rail to the chair, there are nine vertically set spindles across the back intersecting with two narrow, curved laths to form a grid or lattice with a small rectangular block at each intersection. Note the top of the front legs were cut out of a block - rather than being turned - and that form shoulders for the housing of the front and side rails of the seat. The leather of the upholstered seat is taken over the rails in the traditional way. Made in Cuban mahogany by Johannes Hansen, the Lattice Chair was shown at the Cabinetmakers' Exhibition in 1942 in a rather formal room setting with a round dining table, a version of the dining chair with arms, a small sideboard on a stand and a large cabinet over shallow draws, also set on a stand, and presumably designed for storing table wares and table linen. With patterned wallpaper and a framed landscape above the sideboard, this appears to represent a good and fairly traditional middle-class dining room. Along with the dining room furniture there was a sitting-room area with a sofa and an arm chair, both upholstered in striped material and both on square wood legs with stretchers so again not particularly adventurous although the way the furniture was arranged was much much less pretentious and ornate than the furniture might suggest and looks forward to less formal interiors in the 1950s and into the 1960s … so the large window had a Venetian blind without curtains with a low trough across the window filled with house plants* and above the three-seat sofa were three prints in simple well proportioned frames in lightwood hung in a tightly-spaced line in a way seen in some arrangements by Kaare Klint. One of the chairs was purchased by the design museum so this was the first chair by Wegner to be in a public collection. The house plants in the room setting were quite a period piece … most with ornate leaf shapes with what looks like a variegated Begonia, a Philodendron and the ubiquitous Monstera - known in England as a Swiss Cheese Plant - and popular through the 1950s and 1960s. From the late 1920s and through into the 1940s, the furniture manufacturer Fritz Hansen Etft experimented with new materials and tried out new manufacturing methods. They made chairs with frames in steamed and bent wood, producing several chairs based on chairs produced by Thonet in Austria from the middle of the 19th century with a bentwood frame for the seat and bentwood legs with a plain seat cut from plywood and without upholstery. This chair, designed by Søren Hansen, uses plywood in a much more ambitious and much more obvious and prominent way. The boldly-shaped back of the chair was cut from plywood and bent into a curve around the bentwood frame of the seat and then fixed in place with screws. It might appear to be rather crude in form and it looks as if it would spring apart or even collapse if you lent back in the chair but the design is relatively strong with the arm rests made from a single piece of bent wood that loops around behind the back to provide support. Søren Hansen was a grandson of the founder of the furniture company and, with his brother, took over control of the company in the 1950s so it would seem that he took this interest in plywood or laminated wood forward so the shape of the plywood back should look vaguely familiar ..… surely this is an early version or a preliminary stage of a shape that was to develop ultimately into the more sophisticated and much more famous Chair 7 by Arne Jacobsen? The main difference is that the back of this chair by Hansen is curved in just one plane and it must have taken quite a few trials and experiments before the workshop could perfect the complex form of the later shell chairs that are curved in two planes to form a seat and back together in a single piece of plywood. The year of the design also explains, in part, the reasons for the experiments with plywood and bentwood for making chairs. Through the Second World War, good high-quality timber for making furniture was scarce and of course the situation meant that most people were spending much less or no money on new furniture. But, actually, the war also saw rapid improvements in cutting and shaping plywood as it was used for building light-weight planes and boats with thin sheets of laminated wood pinned over a wood frame. Alvar Aalto had designed several chairs in the 1930s that used bent plywood but with the curves in a single plane … essentially a long scroll … but it was in the United States that the designers Charles and Ray Eames developed designs of shell-shaped chairs in plywood and plastic in the late 1940s and early in the 1950s. There is a Chinese chair in the collection of the design museum that seems to have fascinated Danish furniture designers. Dating from about 1800, it has a box-like lower frame with square and square set legs with stretchers that are only just above the ground. Flat, shaped pieces are used - inset from the frame of the seat and the legs as reinforcements - almost like angle pieces or angle brackets - but what seemed to have intrigued designers in Denmark was the complex curve of the back rail or back rest that is bent round and down towards the front ends and this is supported at the centre of the back by a thin plank or splat that is housed in the top of the back rail of the seat and in the underside of the curved back rest. 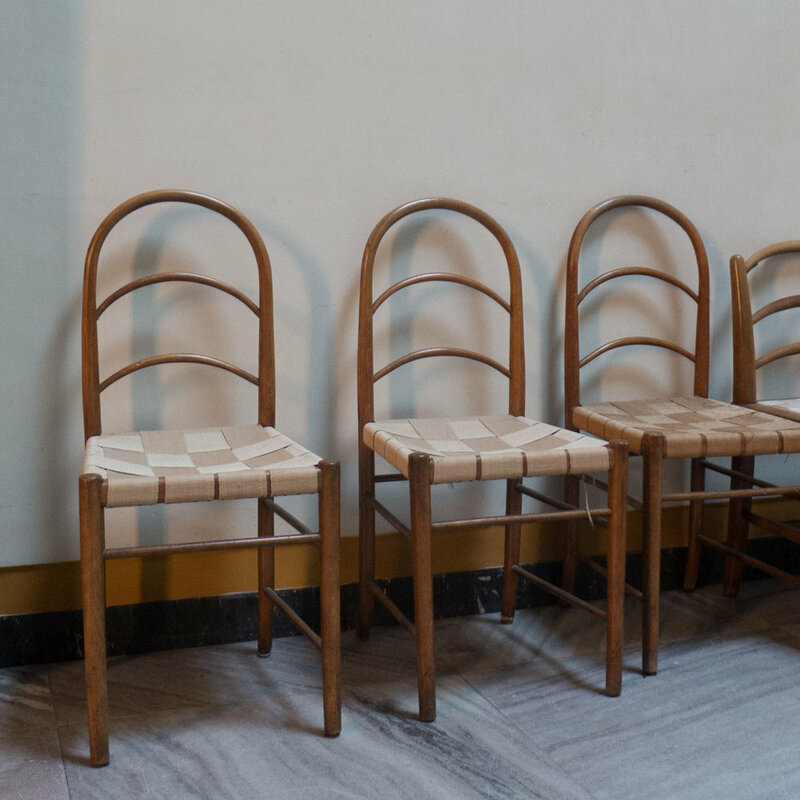 Hans Wegner produced several chairs of this form - at least seven through the 1940s - with some going into production and some remaining as prototypes. Christian Holmsted Olesen in his book Wegner just one good chair illustrates these and explains the sequence of development that was to lead on to the design of the Wishbone Chair. This sequence was set out in one section of the major exhibition on the work of Wegner that was at the design museum in 2014 to mark the anniversary of Wegner's birth. Wegner was in his late 20s and early 30s when he was working on these designs so, in many ways, what you see here is a process through which the designer learnt his craft. He was working with cabinetmakers in close partnership and much of this was a learning process for them as well as they pushed materials and shapes and wood-working techniques to new levels but above all it was actually commercially led so was about not just novelty but about how you could produce good chairs in larger quantities. In the Chinese Chair here you can see some features that were awkward or difficult to construct in wood. The splat or very thin plank at the back supports the back of the person sitting in the chair but the relatively wide top sits oddly with the curve of the back piece and, in this early example of the chair, actually emphasises the fact that the complex curve is not quite symmetrical around the centre line … so the later Wishbone Chair was given a Y-shaped back in part to get around that but of course it also made the back less dominant. The curve of the back rail here in Wegner's chair is complex - forming first an arch and then curving round and then up on both sides to form, in one piece, the arm rests but again this is simplified in the later Wishbone Chair by forming a simple single curve - though it's a sharp curve - to be made in bent wood but simply tilting it down at the front. The complex double curved shape of the vertical pieces that support the back rest of the Wishbone Chair is found first here but instead of being an extension up, in one piece of wood, from the back leg, on the Wishbone Chair, it is here a separate piece that runs down from the arm and then appears to be halved over the outer side of the seat rail and bird-mouthed over the top of the side stretcher and the stretcher itself is shaped so that all-in-all this is a very complicated point in the construction. The side rails of the seat are set close to the top of the front legs so again make a potentially weak point in the frame as the mortice cut in the leg could be split by the tenon on the end of the rail that forms the join of the two pieces and the slightly lower front rail of the seat and the tenon for the side stretcher are also close together. 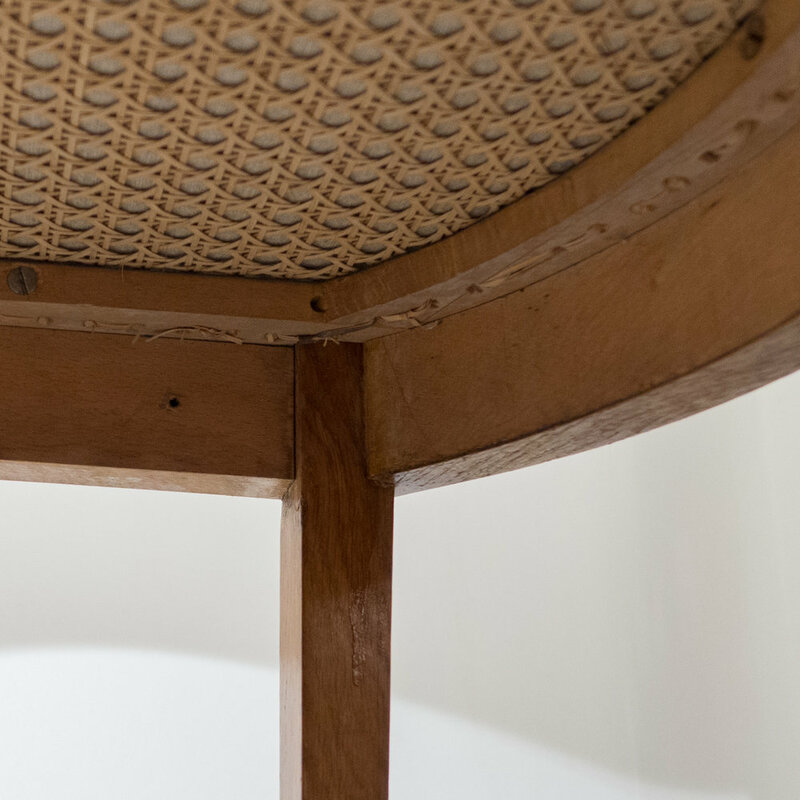 The stretchers are flattened ovals in their cross section and the side stretchers are set quite close to the floor which follows the Chinese original but now appears slightly dated … this arrangement of stretchers is common in mass-produced dining chairs made in the 1930s and 1940s. The legs of the chair are rounded in section but straight (not tapered) and are set vertical so again reflecting a simpler but strong form of construction. If chair legs are angled out and certainly if they are tapered in shape then the shoulders of the tenons become more difficult to cut and the angles of mortices and tenons become more important.